Forums >> Beliefs & Spirituality >> **Cosmic Religion and the New Age** >> It’s Tesla Time! It’s Tesla Time! This Simple Gadget Grabs Power Right Out Of The Air To Power Your Devices! What you see above may look like an unremarkable slice of electronics, but it can theoretically power a low-energy device forever, and for free. If that sounds like a big deal, well… that’s because it is. Drayson Technologies today announced Freevolt, a system that harvests energy from radio frequency (RF) signals bouncing around in the ether and turns it into usable, “perpetual power.” Drayson isn’t exactly a household name, but the research and development company has a particular interest in energy, especially where all-electric racing is concerned. And now it’s developed the first commercial technology that literally creates electricity out of thin air. We’re constantly surrounded by an ever-denser cloud of RF signals. They’re the reason your smartphone gets 2G, 3G and 4G coverage, your laptop gets WiFi, and your TV receives digital broadcasts. Capturing energy from this background noise isnothing new, but most proof-of-concept scenarios have employed dedicated transmitters that power devices at short ranges. Furthermore, research into the field has never really left the lab, though a company called Nikola Labs is hoping to releasean iPhone case that’s said to extend battery life using RF energy harvesting. According to Drayson, Freevolt is the first commercially available technology that powers devices using ambient RF energy, no dedicated transmitter required. The key to Freevolt is said to be the efficiency of its three constituent parts. A multi-band antenna scavenges RF energy from any source within the 0.5-5GHz range, which is then fed through an “ultra-efficient” rectifier that turns this energy into DC electricity. A power management module boosts, stores and outputs this electricity — and that’s all there is to it. Freevolt may well be the most efficient system of its kind, but it’s still only viable for devices that require very little power. In a location where lots of RF signals are flying around, like in an office, a standard Freevolt unit can produce around 100 microwatts of power. That’s nowhere near enough to say, run your smartphone, but Drayson has some specific use cases in mind. The company thinks Freevolt can be the backbone of the connected home, and in a broader sense, the internet of things. Sensor-based devices, such as a smart smoke alarm, can be powered by Freevolt indefinitely. Beacons that provide indoor mapping and targeted advertising are also perfect candidates. While it’s easy to visualize specific examples — a smoke alarm that never needs a new battery, or a low-power security camera that isn’t bound to a mains outlet — the true potential of Freevolt is hard to grasp. We’re talking about free energy here: devices that never need charging, cost nothing to run, and aren’t limited by the location of an external power source. An entire smart city — where roads know when they’re busy and bins know when they’re full — could be devised using countless sensors that require no upkeep, and have no overheads beyond the price of the hardware itself. It’s a powerful idea, and beyond sensors, Drayson imagines Freevolt being used to trickle-charge all kinds of hardware, significantly extending the battery life of a wearable, for instance. What’s more, Freevolt can be scaled up for applications that require higher power outputs, and Drayson is currently working on miniaturizing its initial reference design and creating a flexible version that can be integrated into clothing, among other things. There are limitations to the technology, of course. The amount of power Freevolt can harness depends on the density of ambient RF signals, which are way more prevalent in urban areas than the countryside. A sensor-based product could still operate in these lower-yield environments, though, by monitoring a value every five minutes instead of every five seconds, for example. Drayson’s business model involves selling licenses to Freevolt and its related patents, as well as offering guidance and technical support to interested parties. Development kits are also available to pre-order from today, so advanced tinkerers can get their hands on the tech too. It might take some time before Freevolt finds its way into products, as Drayson is relying primarily on other companies to dream up and develop real-world applications. That said, Drayson has created a consumer product of its very own that’s powered solely by Freevolt: an air pollution monitor calledCleanSpace. The CleanSpace Tag is a continuous carbon monoxide monitor that sends data back to your smartphone via Bluetooth. From the companion app, you can see real-time air pollution levels, and review your exposure during that day, recent weeks and further. The app also keep tabs on your travels, encouraging you to build up “CleanMiles” by walking and cycling rather than taking motorized transport. These banked CleanMiles can then be exchanged for rewards provided by partners such as Amazon, incentivizing you to travel in non-polluting ways. Air pollution is of particular interest to Lord Drayson, chairman and CEO of Drayson Technologies, who hopes to increase awareness of the invisible health risk. But, there’s also a bigger picture. The CleanSpace app uses data from the 110 static sensors dotted around London to build a pollution map of the capital. Each CleanSpace Tag also feeds anonymized data into this system, with the idea being the more tags in the wild, the more locally relevant and robust that UK pollution map can become. CleanSpace users can therefore decide on the fly to avoid more polluted areas in favor of cleaner routes. The plan is to expand the crowdsourced data concept elsewhere if it’s well received, but for now the CleanSpace Tag is only available in the UK through a crowdfunding campaign. Pricing starts at £55 per tag, though you might want to buy one just to rip it open and see the Freevolt backbone hidden inside. The properties of space have been postulated by many, from ancient Vedic philosophy, Eastern Mystics, various ancient civilizations throughout human history all the way to Descartes, Einstein, Newton and more. Humans are curious beings, and our quest to discover “what is” will never end. Science now knows that a material universe as the foundation of what we perceive to be our physical material world isn’t quite the case. Today, physicists recognize that physical atoms are actually made up of vortices of energy that are constantly spinning and vibrating. At its smallest observable level, matter is energy, and this energy that exists all around us can be tapped into and possibly used to generate power. Quantum physics has left many scientists baffled, again, the discovery that our physical material reality isn’t really physical at all can be quite confusing. Scientists began to explore the relationship between energy and the structure of matter at the turn of the 19th century, this is approximately the time when the idea of a Newtonian material universe was dropped from the heart of scientific knowing, and replaced by the fact that matter is nothing but an illusion, that everything in the universe is made out of energy. Again, if you observed the composition of an atom with a microscope, you would see a small, invisible tornado like vortex, with a number of infinitely small energy vortices called quarks and photons. These are what make up the structure of the atom. As you focused in closer and closer on the structure of the atom, you would see nothing, you would observe a physical void. The atom has no physical structure, we have no physical structure, physical things really don’t have any physical structure. Atoms are made out of invisible energy, not tangible matter. We’ve seen a very interesting trend (especially within the past decade) of modern-day science catching up to an ancient understanding about the true nature of reality, its make-up, how it functions and how we can work with it to bring about change on our planet. For anybody to label the merging of ‘spirituality’ and science as pseudoscience means they have not properly investigated it. Spiritual concepts of our ancient world are directly intertwined with modern-day science, more so quantum physics, and Nikola Tesla was well aware of this. 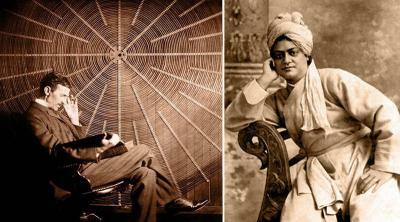 Nikola Tesla had correlations with Swami Vivekananda (1863-1902), who was one of the most famous and influential spiritual leaders of the philosophies of Vedanta (one of the six schools of Hindu philosophy, the term originally referred to the upanishads, a collection of philosophical texts in Hinduism) and Yoga. He was the chief disciple of Ramakrishna Paramahamsa and the founder of Ramakrishna Math and Ramakrishna Mission. He is a giant figure in the history of the hindu reform movements. The Vedas are a group of writings that consist of hymns, prayers, myths, historical accounting, science and the nature of reality. They date back at least 5000 years, and are not so different from other ancient texts that dive into the same matters from all across the globe. The language used is Sanskrit and its origins are unknown. Apparently, Tesla was unable to show the identity of energy and matter, this did not come until Albert Einstein published his paper on relativity, which was known in the East for the last 5000 years. Tesla’s vision of the wireless transmission of electricity and free energy has been postponed for almost one hundred years now. Which brings us to our next topic. Here is a video of world renowned Physicist Harold E. Puthoff. An American physicist who earned his Ph.D from Stanford University. I am best familiar with his work through the declassification of the remote viewing program conducted by the CIA and NSA in conjunction with Stanford University. (source 1)(source 2)(source 3). He is the director of the Institute for Advanced Studies at Austin, and has served various government agencies throughout his years. There are promising inventors and machines in existence today, and we hope to bring more awareness about this to you in the very near future. Hopefully they will make their way out into the world within the next few years. The time is now. Our current methods for extracting energy are destroying Earth. It’s destroying the environment, its people and creates conflict. We are rapidly approaching a time (if not already in that time) where we need to implement systems to eliminate the use of fossil fuels. I hope that this article, and the ones linked within it, show you that this is possible. If you are further interested in this subject, you can check out Michael Faraday, Bruce DePalma, Paramahamsa Tewari and more. Energy source transitions do not happen over night. It took us 100 years to transfer from wood to coal, and another 100 years to move from coal to oil. But the next energy transition must happen quicker than previous ones, and it must include free energy. (2) Hunt, Inez and Draper. Wanetta, W., Lightning In His Hand, The Life Story Of Nikola Tesla, Omni Publications, Hawthorne, CA, 1981. (2) O’Neal, John, J., Prodigal Genius, The Life Of Nikola Tesla, Ives Washington, Inc., 1944. Anderson, Leland, personal communication. See also Anderson, L.I., and Ratzlaff, J.T., Dr. Nikola Tesla Bibliography, Ragusan Press, 936 Industrial Avenue, Palo Alto, CA 94303, 1979. Sources used from another article embedded in this article: All other sources are highlighted throughout the article. On April 27, 1927, Bell Telephone and the U.S. Department of Commerce conducted the first long distance transmission of moving images between Washington D.C. and New York City. The first modern “television” was born. Today we have, in a sense, the transmission of sight for the first time in the world’s history. Human genius has now destroyed the impediment of distance in a new respect, and in a manner hitherto unknown. Hoover’s prediction of the “unknown” stands true today as the modern TV continues to evolve into things humanity never imagined only decades prior. Although most of society couldn’t imagine the impressive capabilities of transmitting moving images over the airwaves, there were a few special folks out there who did. Five years prior to the world seeing the first practical demonstration of the television, and scores before the first instance of the smartphone, Nikola Tesla, not only imagined it but had completed crucial steps for making it possible. Television was only a small portion of Tesla’s predictions, however. In Volume 100 of Popular Science Monthly, January-June, 1922, Tesla would predict FaceTime. 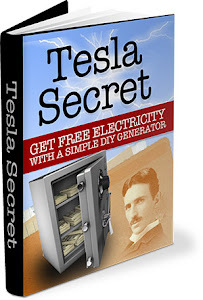 “It will soon be possible to see as well as hear by means of electricity. “Television” will be employed as generally as telephoning. As one listens to a voice at the other end of the line, he will also see every expression of the speaker’s face,” explained Tesla in his article. “It will be possible to see as well as to hear either by the wireless telephone or over the regular wire circuits. There will be no limit to the distance of such transmission, so that we shall be able to talk to a person in any part of the world and watch his face at the same time. But this amazing man, with such grand visions, didn’t stop at the prediction of FaceTime. Just a few years later, in an interview with Collier’s Weekly, Tesla predicted the smartphone. An article dated January 25, 1926, by the Associated Press, documented the interview. Application of radio principles will enable people by carrying a small instrument in their pockets to see distant events like the sorceress of the magic crystal fairy tales and legends, Nikola Tesla, electrical inventor, predicted today. Mr. Tesla, who on several occasion has tried to communicate with the planet Mars, made his predictions in an interview published in the current issue of Collier’s Weekly. “We shall be able to witness the inauguration of a president, the playing of a world’s series baseball game, the havoc of an earthquake, or a battle just as though we were present,” Mr. Tesla said. While every generation is astonished by the advancement of technology, few generations have predicted technological advancements so far before they happened, and with such accuracy that it becomes mind boggling. Imagine the world today if Tesla’s visions were allowed to come to fruition had his work not been seized by the government. But sadly, that was not the case. Only two days after his death, the FBI ordered the U.S. Office of Alien Property to seize all of Tesla’s belongings. Tesla’s entire estate from the Hotel New Yorker, and other New York City hotels, was transported to the Manhattan Storage and Warehouse Company under OAP seal. In an instant, this genius man’s entire life’s work became the property of the government to further their militaristic escapades. However, not all was lost; several new geniuses would rise up and follow in Tesla’s footsteps. People like Jim Murray would diligently devote their lives to understanding this great man, and in turn, create paradigm-shifting technologies like the SERPS (Switched Energy Resonance Power Supply) device. This highly specialized electronic circuit has the ability to “Magnify” the effective power applied to it by nearly 50 times. When Jim coupled his device with his friend Paul Babcock’s patented ultrafast five nanosecond switching technology, they achieved a 4790% increase in electrical power compared to the input. This type of performance, if commercialized, would cause the largest electric utility companies to shake in their boots. It’s been 73 years since his death, and Tesla is still helping to make the world a better place — in spite of government schools making no mention of his contributions to humanity.